So when I was asked recently to help breathe new life and Millenial coherency into the interior of a slightly fading hotel in the Austrian Alps I wasn't sure where to start. It's a huge project, so there was a certain amount of headless chickening, but then I remembered where this always starts whatever the size of the project. It starts with the client, of course, and with the building itself. Hotel Miramonte in Bad Gastein is a Goliath of a building, a concrete behemoth occupying an commanding spot at the foot of the Graukogel mountain looking across a deep gorge to the tumultuous waterfall that runs through the centre of this once very famous alpine resort. The hotel is beautiful in many ways and a huge block of concrete in others, like an ocean liner run aground. Built in 1930s it feels quite experimental for the age and more reminiscent of Brutalist architecture 30 years later. But it certainly has bags of style and this is where I finally, with the help of Ike Ikrath, the owner, drew inspiration from the movies and specifically Bond, James Bond. The early one. The one who had assignations on satin covered sheets and didn't talk about real feelings, ever. The Bond who tore through sets designed by the genius Sir Kenneth Adam. Miramonte has that air of intrigue and glamour, the alpine retreat you might imagine owned by a baddy whose cavernous HQ is built into the rock of the basement. Ike and I looked at stills from Goldfinger and The Avengers (another of Ike's favourites) and pieced together the elements that would create the look we wanted. I kept the alpine goat skin rugs and fluffy bathroom robes (Bond was often in a hotel robe I recall) and wove in the other elements. Sadly the project is not complete yet, so I don't have any 'after' photos but I thought it would be fun to have a look at the way the design I finally came up with evolved. The Miami hotel in Goldfinger. I love the silk couched wall - I have appropriated this look for oversize bed headboards. Goldfinger again. We will use the design of the inset shelf; a strong graphic for housing paperback books, (Ike has a huge collection he puts in the rooms). Copper plating like that on the door will be used to clad the shower and freestanding baths. Avengers - The three lights above his head will be used to light the Bath alcoves in the rooms. I drew on the strong colours in Emma Peels' wardrobe for the fabric choices of the upholstered elements in the rooms, lemon yellow, bubblegum pink, deep night blue. 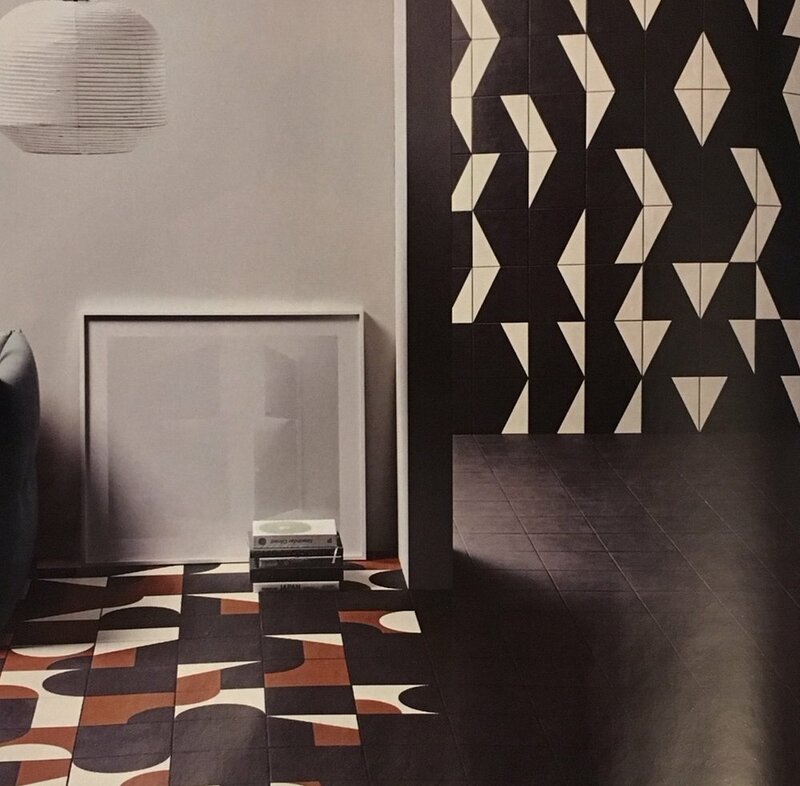 These new Puzzle tiles by Edward Barber and Jay Osgerby for Mutina will to work perfectly with the late 60s look. Peignoir by Farrow & Ball. The grown up grey pink will work in summer or winter, so perfect for an alpine hotel that operates in all seasons, and be a great ground for the brighter colours. As modern as this seems when combined with the paint colour above, this laid back but luxurious layered bed linen in pinks and greys will work perfectly. No alpine hotel would not be complete without this at the foot of the bed - goat hair ottoman.